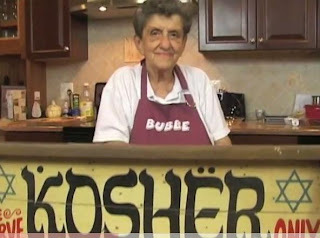 Some of our most popular blog posts have been of grandmothers, or bubbes, cooking Jewish foods using their own recipes. First we shared a recipe for sweet and sour meatballs by a bubbe from Worcester, Massachusetts. Then, for Rosh Hashana, we shared a recipe for gefilte fish, watching a bubby from Montreal buying the the fish in the store and all the steps along the way to serving it on the table. Now, with Chanukah about three weeks away, we think it's time to stock up on the essentials for making heimishe potato latkes from scratch. Who ever thought the internet would awaken the star potential of bubbes everywhere who are probably saying "Food Network, Shmood Network. Why don't you show me in my kitchen?" So here is "The Bubbe" showing us how to prepare homemade potato (and also veggie) latkes. Who is the Bubbe? She's Lisa Murik from Silver Spring, Maryland -- an octogenarian, holocaust survivor, and great-grandmother who is much beloved by family, friends, and the greater community for spreading her love of food. You can read her story at www.thebubbe.com and in an article in Gazette.net, a Maryland community newspaper. Then, it's time to start cooking. Enjoy! She reminds me of my bubbe and I''m 88. Who ever heard of a food processor in her day? It captured the warm nostalgia. Loved it. Seriously... could she be any cuter? Loved this video and will follow her recipe as directed. Happy Chanukah to you Bubbe! !